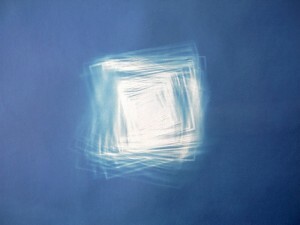 Made by placing photo-chemically treated paper flat on the earth and exposing it to natural sunlight over several minutes, Floater 2 is like an oversized cyan pixel, wherein an old photographic printing technique calls up the particulate-matter of the digital realm. Cyan is both the chemically-expressed color of the cyanotype process and the artificial color of the oceans of satellite mapping, a la CMYK. The spatial nature of the photo-process itself suggests a collapse of the space between the sun and the paper, the sky and ground.